Improper screen brightness can cause your eyes to tire faster and a bright screen at night can make it difficult to fall asleep. WildGuppy tries to overcome this by adjusting your laptop's brightness automatically based on the ambient light, using the laptop camera as a light sensor. WildGuppy can be used either via command line or by using an Ubuntu AppIndicator. From its settings you can define the time interval for webcam samples, set the maximum and minimum brightness levels or manually set the brightness. Note that once you set the brightness manually, the webcam sampling process stops. This tool will probably remind you of Calise, which has more features but is pretty hard to setup for regular users while WildGuppy is very easy to use. 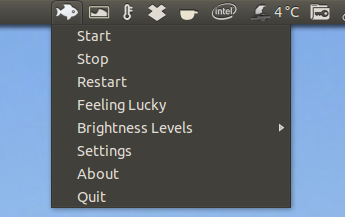 Once installed, you can launch WildGuppy (AppIndicator) from the menu / Dash. If you want to use the command line version, type "wildguppy" in a terminal. To get WildGuppy to adjust your laptop's brightness automatically based on ambient light, select "Start" from the AppIndicator menu. To download the source code, report bugs and so on, see WildGuppy @ GitHub.